Include buko pandan in your food cart or restaurant menu. Here’s how to make this popular dessert. Filipinos certainly love desserts. In almost every party or family gathering, you can surely find and enjoy desserts made of buko or young coconut, which abounds in the market, the country being an active producer of coconut. 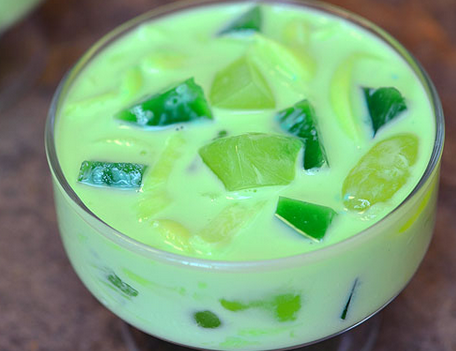 Buko pandan is one of the staples in the traditional dessert table. It has an irresistible pandan aroma with a refreshing look, made of green cubes and young coconut strings. Its creaminess may also leave you craving for more. Believe it or not, this sumptuous Pinoy dessert is easy to make. Buko pandan can also be added to the menu of your restaurant or food joint. We’re teaching you how to make it now. 1. Pour water into cooking pan. Sprinkle powdered gelatin into it and stir constantly to dissolve. Apply medium heat. 2. Continue stirring until the solution boils. Add sugar and evaporated milk and continue boiling for a few minutes. 3. Turn off heat and transfer the mixture to a mold. Set aside until the gelatin cools down and solidifies. Once the gelatin hardens, slice it into small cubes. 4. 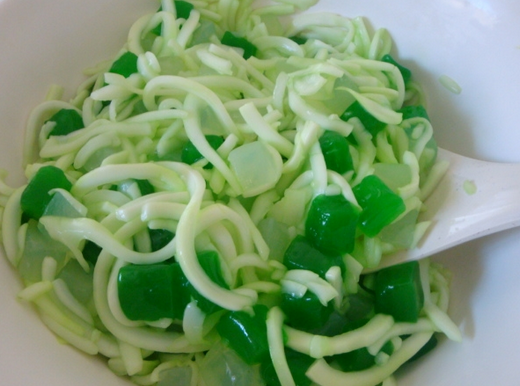 In a bowl, combine the gelatin cubes with drained nata de coco and drained coconut strings. Pour condensed milk and all-purpose cream into the mixture. Mix well. 5. Chill your buko pandan in the refrigerator until the texture thickens. 6. You may serve the dessert in a bowl or scoop into plastic cups, which you can easily sell in your food cart or food stall.